May means blossom and bluebells and gardens in abundance! 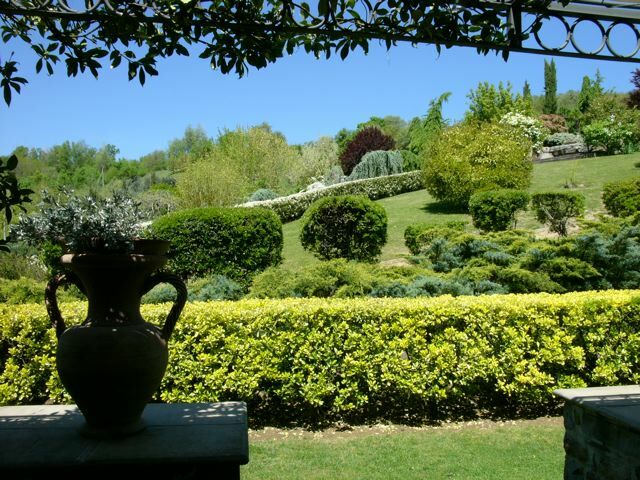 An air of enchantment- magnificent magnolias, cascading wisteria and fragrant lilacs bring a sense of exuberance to an idyllic Italian garden overlooking the Niccone Valley in Umbria. 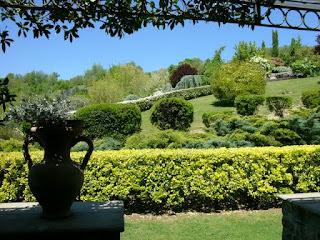 Arriving at this Umbrian property is a distinctly Narnian experience. One moment you're driving through the little village of Niccone, you turn to a country lane, and find yourself in another world. A track overhung with trees opens out to reveal a magnificent stone Italian villa. Terracotta pots brim with tulips in shades of red and pink, while billows of acid green euphorbia lend all the colours a vibrant intensity. Leading from the house, serried ranks of yew and palm trees topiary of various shapes and sizes keep the exuberant borders at way. This is theatre on a grand scale and is exactly the effect to be expected from the owners, whose garden designs evoke an age when gardens were as much an entertainment as they were a place of horticulture. Architectural fragments, follies, grottoes punctuate the planting and add an air of jollity to what might otherwise be a rather grand garden. A tangible air of joy pervade both house and garden!